In the aftermath of Uno Chicago Grill's parent company filing for bankruptcy, its Manhattan location at South Street Seaport seemed far away from the bad news. Tables were nearly full when WalletPop popped in at lunchtime on Thursday. 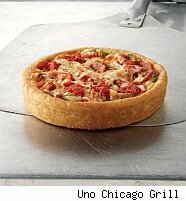 Many customers, including yours truly, indulged in the signature Chicago deep dish pizza. "We're the most popular [Uno] in the country," Ben Niass, general manager of the South Street Seaport Uno, told WalletPop. But somebody's not doing well somewhere, even if the company was offering its "no-biggie" line to other financial outlets. Here's the, ahem, deep dish: Uno Restaurant Holdings Corp. officially asked for Chapter 11 protection on Wednesday, offering as reassurance the $142 million deal that's been in place with bondholders for months. An Uno statement published in the Chicago Tribune Thursday called the debt-for-equity pact a "prearranged reorganization transaction." An UNO marketing executive said this was not necessarily a bad thing, and that Uno should emerge from bankruptcy by spring. In the meantime, all 179 restaurants will remain open. I've never heard of bankruptcy associated with anything positive, but we'll give Uno a sliver of the benefit of the doubt. Niass is. He said to WalletPop that meetings were ongoing in Yonkers, N.Y., as we spoke to reassure managers that "everybody was safe." But Niass acknowledged that some restaurants had to shape up. The chain attributes its misfortune to less consumer spending and higher costs for ingredients. For many of us thin-crust diehards, Uno was our first exposure to the other side. It has always been a pleasant change of pace. I still look forward to the thick-as-Silly-Putty cheese, sweet doughy crust and tomato chunks bursting with Tuscany in July. Or at least Jersey. The same tastes delivered on Thursday. It's not a bargain at $10.79 for the individual size, but an affordable lunchtime indulgence. I fondly recall my visit to the flagship restaurant at Ohio Street and Wabash Avenue in Chicago with a group of tipsy sportswriters. On Thursday, the South Street Seaport location teemed with that same feel-good vibe. I just had to spoil it by informing other diners of the bankruptcy. "That's shocking," said John Legrand, a regular. "Is somebody messing with the accounting?" Liz Jacob wondered if perhaps the dip in travel everywhere because of the recession had affected the Unos in touristy locations. He expressed confidence that a balance sheet restructuring would do the trick. "This is what will take us into 2012 and forward," he said. If not, Uno and its stakeholders will be in deeper...dish.